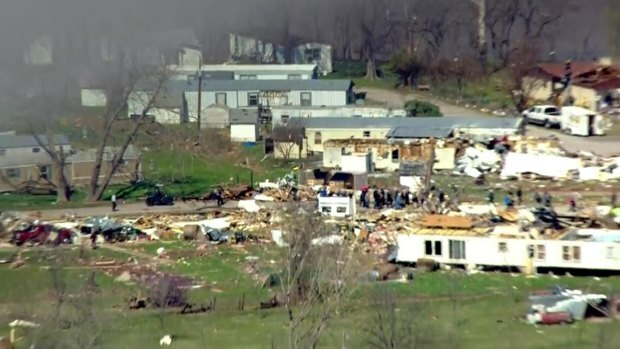 The National Weather Service says survey teams confirm more than one tornado hit portions of western and southern Oklahoma City and Moore in the Plains' first tornado outbreak of 2015. The NWS says one high-end EF1 twister hit Moore and survey teams say there were winds up to 80 mph with brief weak tornadoes. The exact number and strength of the tornadoes will be calculated in the next few days. One person died and dozens of people were injured when tornadoes hit parts of the Oklahoma City and Tulsa areas during Wednesday's evening rush hour. Oklahomans salvaged soggy belongings while expressing gratitude that casualties were low but understanding that nature's next punch could be far worse. "Words can't explain it, things happen for a reason, but I'm just happy that we're still here," said Brenda Chavez. The Chavez family say the storm was powerful. The roof of their home was ripped off and their belongings were thrown into the yard. A state of emergency is now in place in 25 counties in Oklahoma after deadly tornadoes ripped through Moore and Sand Springs. Antonio Chavez, his wife and their four puppies hid in a closet inside their home. "He just grabbed me, threw me in the closet, threw a blanket, grabbed my dogs, sat on top of me in the closet until everything passed," said Brenda Chavez. "My mind went blank, I just had my Chihuahuas, that was my main priority, my dogs and my husband and that's it." The couple said all they could do was pray. "I was just praying, praying to the Lord, saying please help us," said Antonio Chavez. "Like five seconds, everything was gone." Sun came up Thursday to reveal the damage caused by severe storms that spawned a tornado in Moore. A few streets over, the Von Etten family also relied on their faith as they rode out the storm that took the roof off their home. "My husband was holding the door closed and he was praying out loud, that's all you could do," said Courtney Von Etten. Damage, debris and determination fill the streets of Moore, but the spirits of the people of Moore remains unshaken. "We just keep telling them everything is going to be okay, God protected us, we are alive," said Von Etten. Storm chasers in Moore, Oklahoma survey the damage after a possible tornado ripped through the city Wednesday night. Moore’s longtime mayor, Glenn Lewis, described the recent twister that hit his city as "kind of like a junior tornado for us" as he assessed the damage Thursday. Gov. 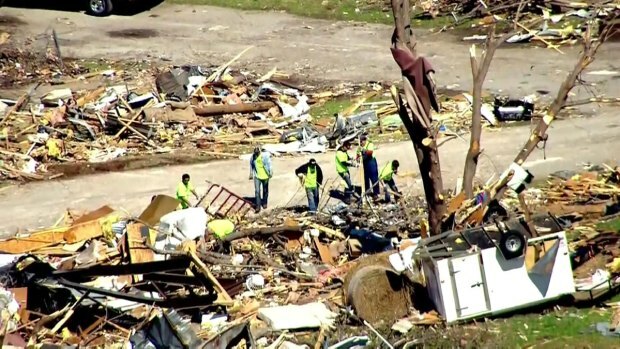 Mary Fallin declared a state of emergency for 25 counties ahead of a visit to Moore, where seven school children were among 24 people killed in a top-scale EF-5 tornado in 2013. Wednesday's storms were considerably weaker, and the governor said damage was still being assessed. 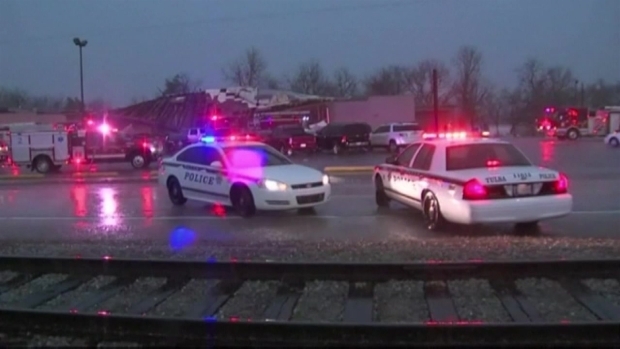 Violent winds from the first tornado of the season have caused major damage and one death in Sand Springs, Oklahoma. "We've been down this road before. We know what to do," Fallin said after touring an elementary school that lost its roof. "It's hard to believe 2 years later at a Moore Public School surveying damage," said Fallin. "I'm very thankful that this school did not receive this damage during school hours." Moore has been hit by 22 tornadoes since 1893, and since 1999, four storms have been rated near the top of the scale for tornado damage. A small tornado swept across parts of Moore, Okla., the same Oklahoma City suburb where 24 people died in an EF5 tornado in 2013. Residents of a hard-hit Sand Springs, just west of Tulsa, said the storm was agonizing. "Tornadoes mean a loss for a lot of people and their property," Lisa Reagle said as she rummaged through her father's demolished mobile home looking for photographs of him playing music with Merle Haggard. Deidre Maxwell scoured the debris for her parents' prescription medications and any family keepsakes. She also was looking for the family car, a PT Cruiser that had been parked beside their mobile home. 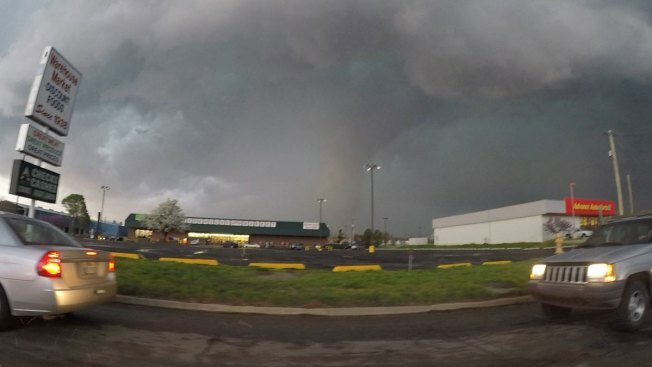 A time lapse video from the tower cam at NBC affiliate KJRH in Tulsa, Oklahoma. Severe storms, which spawned a tornado, blew into Tulsa County, Oklahoma Wednesday evening. "I don't even know how I'm going to get in this," she said, struggling to lift the front door from the nearly demolished trailer. Wednesday's storms broke a months-long tornado drought in Oklahoma; a day earlier, an Arkansas waterspout was the first twister to hit the U.S. in a month. Reagle credited "a God thing" for the low casualty count, and Tulsa County Undersheriff Tim Albin said the area fared surprisingly well through tornadoes, hail and heavy rains. "I'll tell you, when we got to pulling up on the scene you just thought we were going to be pulling a hundred bodies out of here," Albin said. Desiree Roberts said the mobile home she lost in the storm was likely her last. "The risk is just too great," she said. 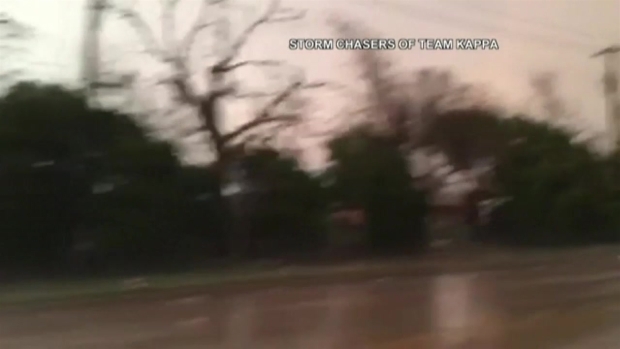 Drivers recorded video as a massive tornado ripped through Sand Springs, Oklahoma Wednesday evening. One death has been reported in the area. The U.S. had had an unusually quiet start to the tornado season. After a series of storms in early January from Mississippi to Georgia, cold air settled into much of the country, suppressing violent weather. Tuesday's waterspout over Bull Shoals Lake in Arkansas was the nation's first twister in March; the month typically has 120. The last time the U.S. had no twisters in March was nearly 50 years ago, but a slow start means nothing once the atmosphere becomes ripe for storms, according to the U.S. Storm Prediction Center. "We always know it's a possibility, and it may be `You're next,"' Reagle said.